Haute Farms Parsnip recipes. Impress the whole gang with these great parsnip recipes, perfect for any setting. Part of the Apiaceae family, which also includes carrots and parsley, the parsnip is native to the Mediterranean; it was popular in ancient Rome and Greece, where it was a central part of medieval and Renaissance-era diets. Parsnips arrived in the New World with the first colonists, who served them much like we do today: boiled, baked, or mashed. While similar in taste to the carrot, the parsnip is far sweeter, especially when roasted. In fact, before sugarcane arrived in Europe, parsnips were often used as a sweetener. (They were also considered an aphrodisiac; yet another reason to fall in love with them.) Never run out of ways to use up those parsnips this season with these great recipes. 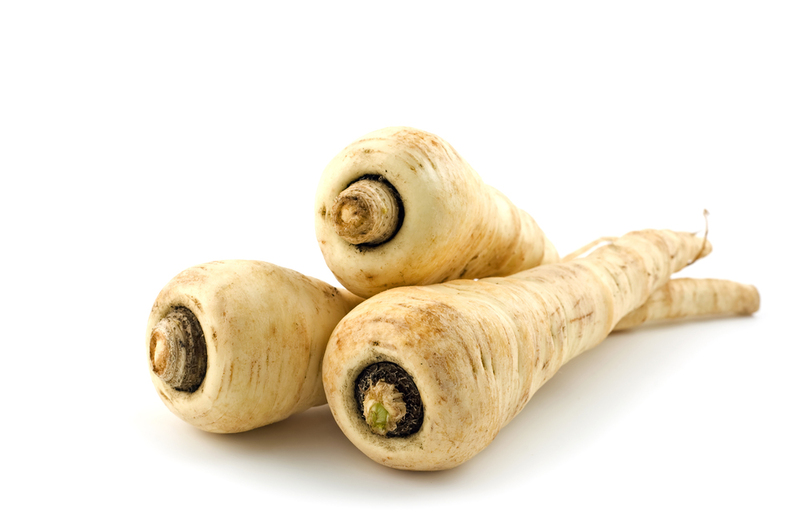 Look for parsnips that are light beige to bright and creamy white, with no blemishes. Like carrots, they should be firm, with a minimal amount of give when you try to bend them. The most flavorful parsnips are usually small to medium in size. The optimal location is a root cellar, but if your house (or studio apartment) is lacking one of those, just wrap parsnips, unwashed, in a plastic bag and leave them in the fridge for up to two weeks. Parsnips are ideal for flavoring winter stews, but can also be served mashed, glazed, puréed, or roasted in herbs, such as rosemary or sage. Wash before peeling, remove the ends, and slice according to whichever recipe you’re using.